Lake Courthouse, Crown Point, Indiana « James Douglas Smith, AIA, R and B Architects, LLC. Crown Point Indiana was selected as the Lake County Seat in 1840. The population of the tiny settlement was at that time was 21. A temporary log cabin had been built to serve as the courthouse which was outgrown by 1849. A new frame building was constructed however it was outgrown and was out of character for the growing area by 1876. An impressive edifice was designed by a prominent Chicago Architect, John Cochran who was also the architect for the Illinois State capital in Springfield. It was a massive, powerful, building, designed with Romanesque and Georgian features. The central portion, including the clock tower, was started in 1878 and dedicated in 1880. The cost was $52,000.00. Because of the growth of county government, the court house was enlarged by adding a north and south tower. These additions, started in 1907, were dedicated in 1909 and cost of $160,000.00. Continued county growth demanded the single story north and south additions be added in 1928 at a cost of $80,000.00. In the early 1970’s the county had once again outgrown the building, but this time opted for a large campus style complex two miles north of the Square. The move put the “Grand Old Lady” in jeopardy. Money had been put aside by the County for demolition and creation of a parking lot, an unfitting end to such a fine structure. Before the wrecking ball could claim yet another historic treasure, a group of concerned citizens formed a not-for-profit foundation to preserve the building. The newly formed foundation used the $70,000.00 in demolition funds as seed money to save, restore and use the building. 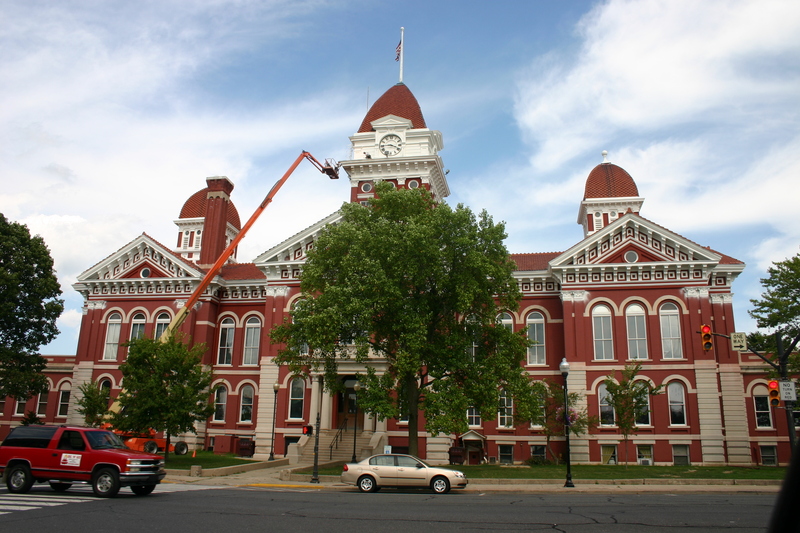 The Court House was placed on the National Register of Historic Places on May 17, 1973. The Lake Court House Foundation, Inc., a non-profit organization, continues to maintain and restore the building.